I know, I know – I told you “Hipsters” was over. 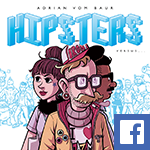 But last Saturday, I participated in a 12-hour comic contest and spontaneously decided to draw an all-new 12-page “Hipsters” comic for it. I hope you like it!